Since the untimely and tragic passing of the Reverend Timothy Wright in 2009, the Wright family has endeavored to sustain his gospel legacy through their own contributions to the genre. 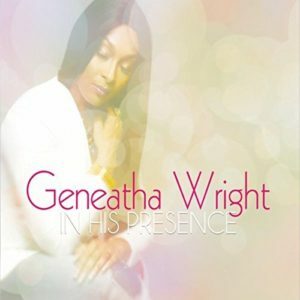 In particular, Wright’s son, Pastor John David Wright, and his wife Geneatha (nee Daughtry) have for several years released music under David’s Godfather Records imprint, named for the late Reverend Timothy’s moniker as the Godfather of Gospel. For David, it’s been work with the New York Fellowship Mass Choir. For Geneatha, it’s been solo albums and singles. The latest full-length project from Geneatha, with ample assistance from her husband, is In His Presence. Recorded live at Grace Tabernacle Christian Center in Brooklyn, the album is a Praise & Worship outing comprised of a pile of songs written by a parade of contributors, including Xavier Hale, Marcus Williams, Stephen Ballard, Trevone Perry, and David Wright. Geneatha’s vocal style falls somewhere between R&B songstress and young evangelist. Not predisposed to vocal runs full of flowers and frills, Geneatha offers a straightforward delivery with occasional shifts into gruff shouting. The album’s top two selections are the title track and “Fill This Place.” “In His Presence,” written by David and a JGM Pick of the Week earlier this year, is anthemic and supported richly by guest vocalist Denise Renee and the Bible Faith Tabernacle Choir under the direction of Prof. Dovon Foster. The choir joins Geneatha again on “Fill This Place,” a melodic and flowing worship ballad. While In His Presence stays mainly in its P&W lane, with easy melodies and simple lyrics, there is one traditional moment. “When We All Get To Heaven,” featuring Glen Gibson, is a ponderous version of Eliza Edmunds Hewitt’s nineteenth-century hymn (Hewitt is also known for writing “Will There Be Any Stars in My Crown”). The organ hypes up the song’s place in traditional gospel, its lyrics an evocation of the joy awaiting the Wrights when they reunite with their dearly departed parents.